It’s much easier to walk down 133 steps at the beginning of an evening, than walk up 133 steps after a huge dinner, especially on a cold, wet January night. 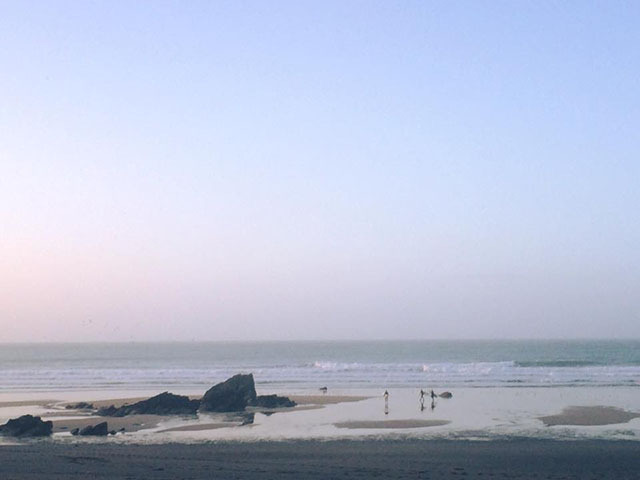 Lusty Glaze is famous for its stunning location, and its restaurant sits right on the beach at the northern end of Newquay. It is accessible from Tolcarne Beach at low tide, but otherwise it’s the 133 steps. 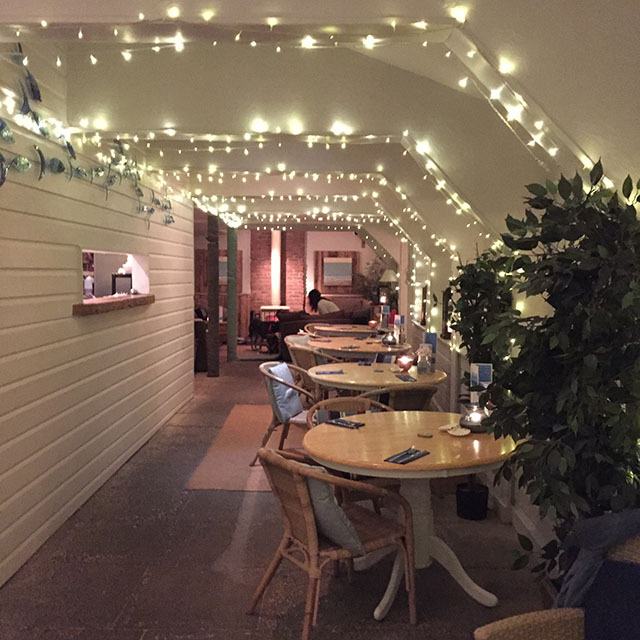 The restaurant itself is decorated with fairy lights and, when we visited, it was gorgeously warm and cosy compared with the stormy night outside. At one end of the restaurant is a log burner with plenty of comfy sofas and board games; a perfect spot to while away the hours. 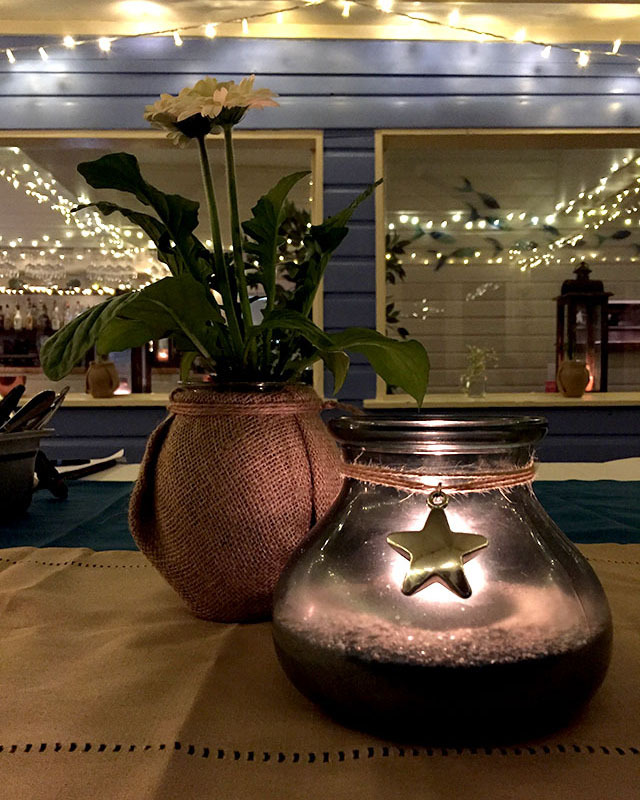 We were lucky enough to be invited along to Lusty Glaze‘s Secret Supper Club in January. The format of these evenings is that twelve people sit around a large table and head chef Nat Tallents cooks supper in front of you at the table. It’s a lovely, informal way to spend an evening, either with a group of friends, or on your own, as you can chat to Nat and others at the table. The menu is only revealed to guests on the night, and we were very happy when we saw that we were about to devour a seven course Indian themed feast. What a treat. We took to our seats, the wine flowed, and Nat got to work. It was fascinating to watch her cooking, and we quizzed her about her past: she’s a self-taught chef and took part in “MasterChef: the Professionals” in 2012. 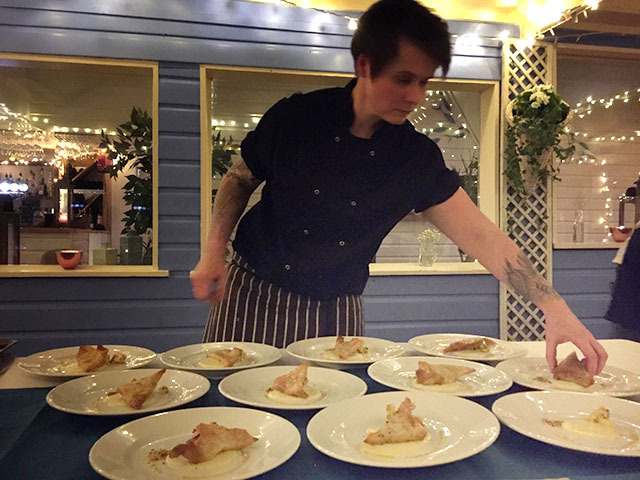 The lure of Cornwall proved too much, and she became head chef at Lusty Glaze in September 2014. So, to the food. We kicked off with a crispy little pakora, well-spiced and filled with chickpeas and cauliflower. This sat on a cauliflower purée and two perfectly seared scallops. This really got our taste buds going. Next, a beautifully rich duck dish, with slices of duck breast and soft, shredded duck leg, pistachios and fennel. 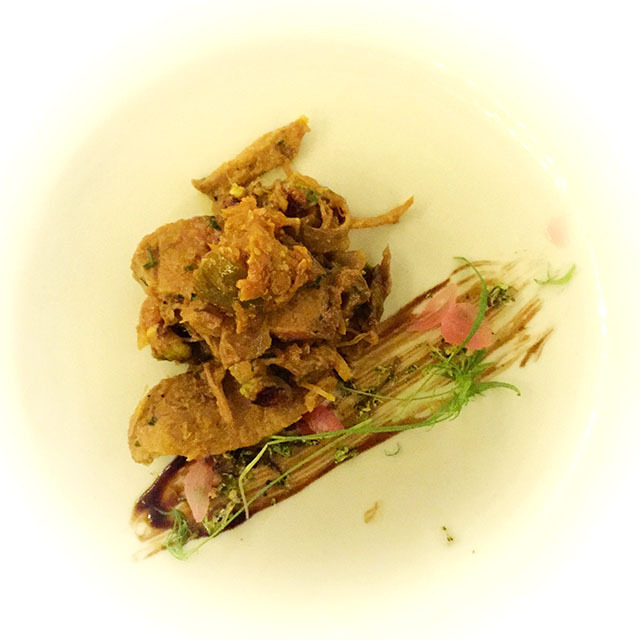 A sharp lime pickle cut through the richness, and the plate was balanced by the sweetness of mango and apricot chutney. 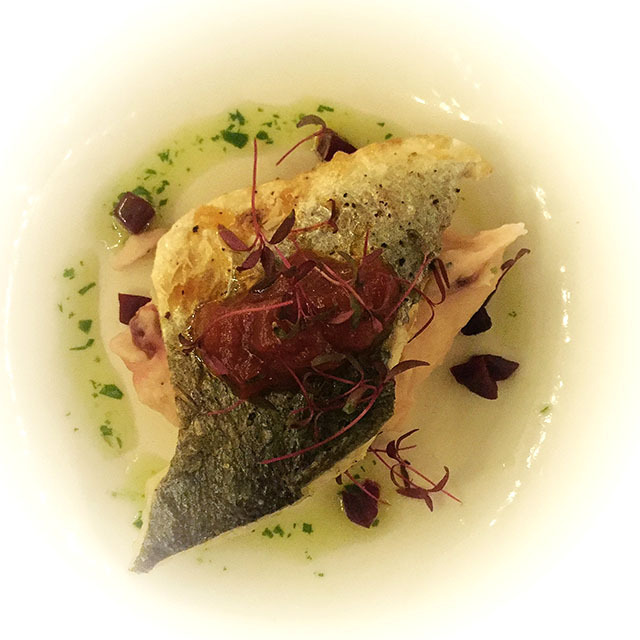 Course number three was beautiful to look at; a fillet of sea bream with crispy skin sat upon spiced mashed potato and was served with little cubes of beetroot, and a zingy lemon and chilli dressing. Still going strong, we tucked into the fourth course. 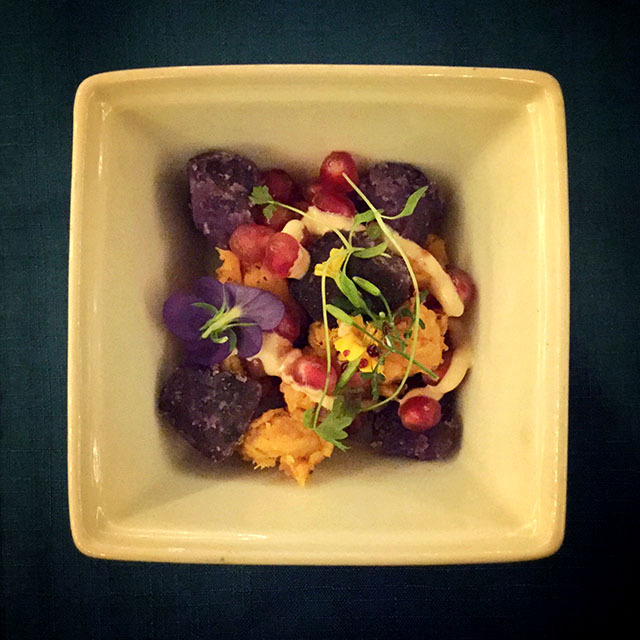 Melt-in-the-mouth purple and sweet potatoes had a spicy warmth that built as you ate. The sweet pop of pomegranate seeds and dash of yoghurt added a little freshness to the dish. 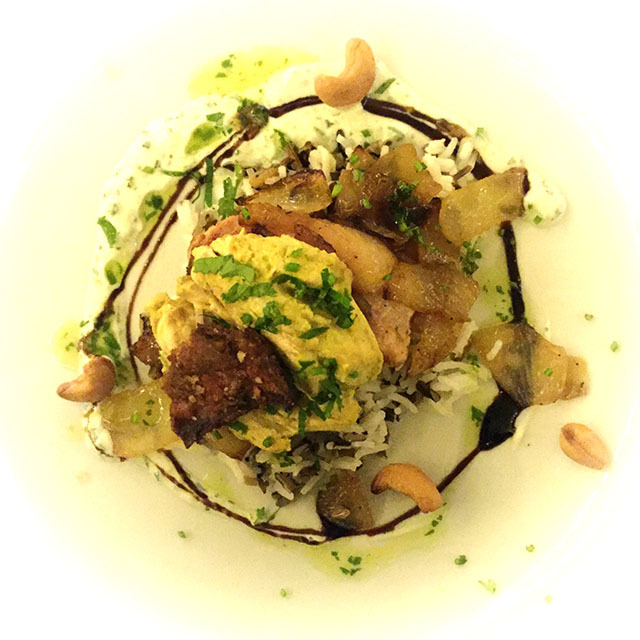 For the main course we enjoyed a gently spiced chicken dish, with wild rice and sweet onions, cashews and a fresh mint and coriander sauce. The crispy pieces of chicken skin were a special treat. I confess that we were beginning to slow at this point, but the first dessert course was a refreshing little glass of rose and raspberry jelly, sprinkled with chai. 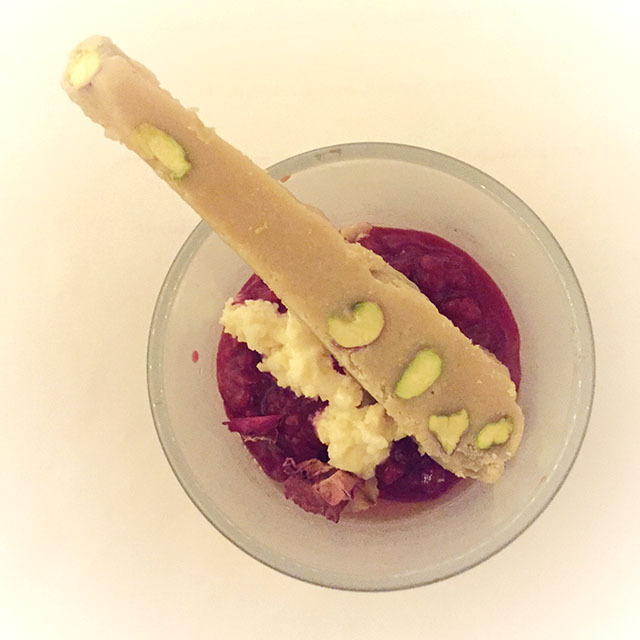 Rose can sometimes overpower, but this was perfectly balanced, and the stick of homemade pistachio fudge was delicious. 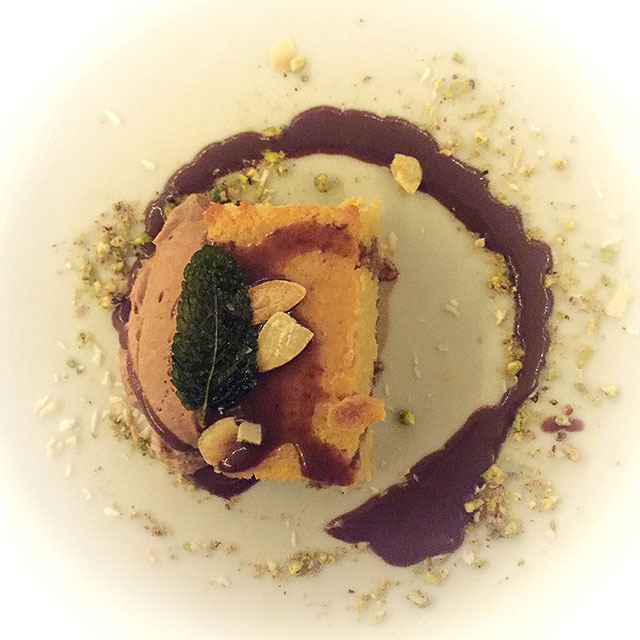 At last, the final course was upon us: a warm, fresh-from-the-oven slice of orange and cardamom cake, drizzled with syrup, topped with a quenelle of chocolate ice cream and pistachios. This was a triumph, really moreish and a suitable conclusion to a delicious meal. And that is why we struggled to walk back up the 133 steps. Thank you to Nicola and Nat for inviting us to Lusty Glaze, and for looking after us so well. We’re looking forward to visiting again soon. 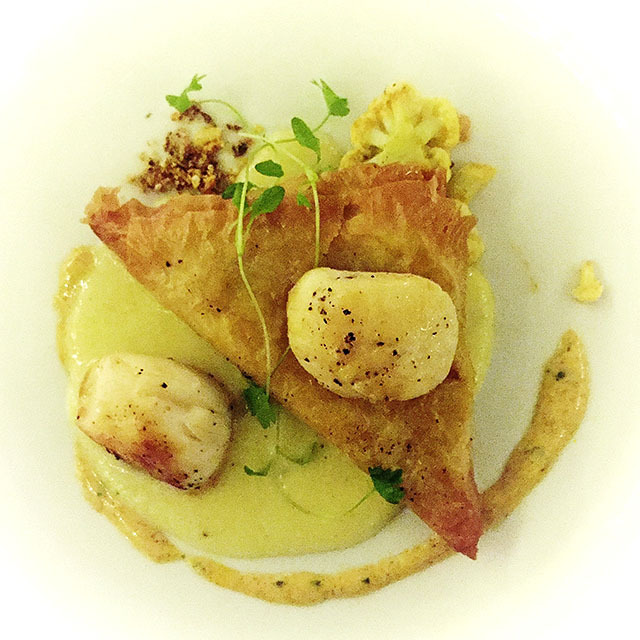 The February and March Secret Supper Clubs are already sold out, and the next events will be held on 28 April and 26 May. 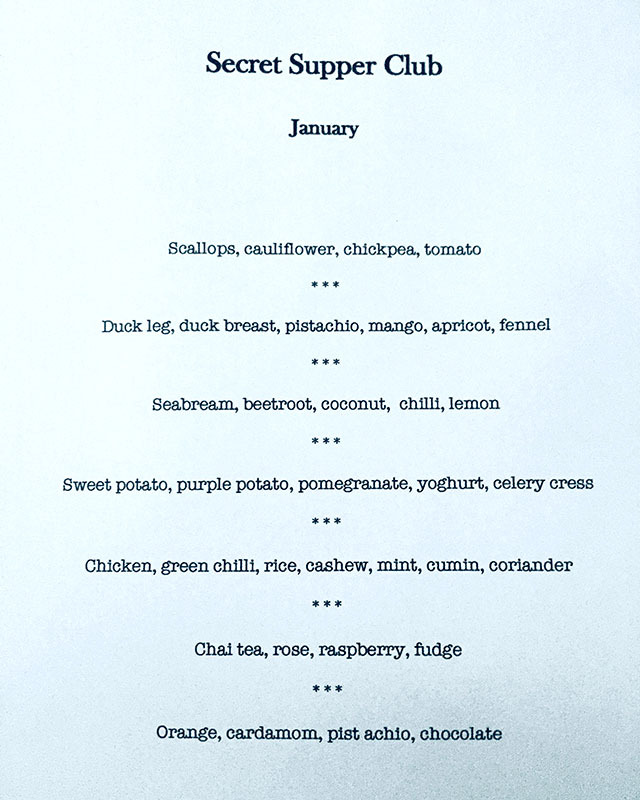 Only twelve seats are available and the menu will be revealed on the night. Tickets are £45 per person and available to buy online. 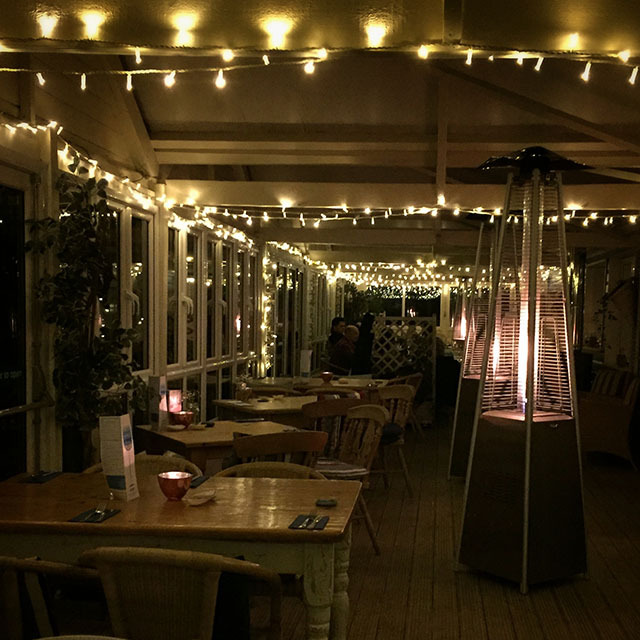 Other winter events include regular Woodburner Sessions, Sunday roasts, steak and wine nights and more. For full details see www.lustyglaze.co.uk.